Fifty percent of uncommitted voters who tuned into Thursday night's vice presidential debate in Danville, Ky., said they see Vice President Joe Biden as the winner over Mitt Romney's GOP running mate Rep. Paul Ryan, R-Wis., according to an instant poll taken by CBS News. Of the 431 polled immediately following the debate, 31 percent deemed Ryan the winner, and 19 percent said they felt it was a tie. Party-wise it's a switch from last week's presidential debate, which uncommitted voters handed easily to Romney over President Obama. Ryan, though, faced a loss among voters' opinions of which candidate would be an effective president, if necessary. 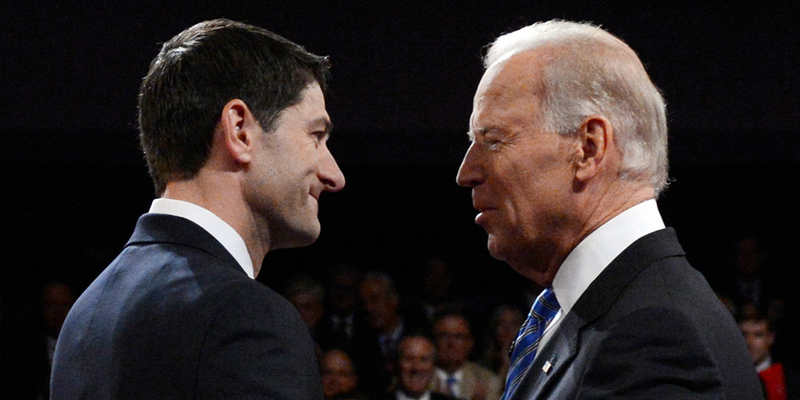 Before the debate, he led Biden 45 percent to 39 percent; after the debate, 56 percent of those polled said Biden would be an effective president, with fewer - 49 percent--saying the same about Ryan. The "uncommitted voters" who participated in this poll are either undecided or have chosen a candidate but say they could still change their minds. They are less likely than voters overall to identify with either of the two major political parties: 58 percent call themselves independents, 17 percent identify as Republicans, and 25 percent say they are Democrats. This CBS News poll was conducted online using GfK's web-enabled KnowledgePanel®, a probability-based panel designed to be representative of the U.S. population. The poll was conducted among a nationwide random sample of 431 uncommitted voters who have agreed to watch the debate. Uncommitted voters are those who don't yet know who they will vote for, or who have chosen a candidate but may still change their minds. GfK's KnowledgePanel participants are initially chosen scientifically by a random selection of telephone numbers and residential addresses. Persons in selected households are then invited by telephone or by mail to participate in the web-enabled KnowledgePanel®. For those who agree to participate, but do not already have Internet access, GfK provides at no cost a laptop and ISP connection. This is a scientifically representative poll of uncommitted voters' reaction to the presidential debate. The margin of sampling error could be plus or minus 5 percentage points for results based on the entire sample.